Two weeks before College Complete and Justin Lofton arrived in Charlotte for the North Carolina Education Lottery, they announced their first fan contest of the year. Fans simply registered on the CollegeComplete.com website and followed Justin (@jlracing) and College Complete (@CollegeComplete) on Twitter. In the event that Justin placed in the top 3 positions in the race, CollegeComplete.com would give one registered fan $1,000. 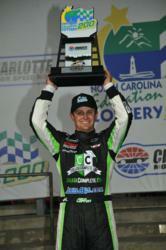 Building on what has been an incredible 2012 season for Justin and team College Complete, everything came together Friday night in Charlotte and Lofton not only placed, but WON the North Carolina Education Lottery 200, beating Sprint Cup driver Brad Keselowski in the race’s final restart. This was one of many fan loyalty contests that College Complete and Justin Lofton will put forward this year. After having already given away CD’s, T-Shirts and trading cards, College Complete and Justin Lofton will continue to give back to the fans throughout the season. Fans are encouraged to continue to visit the CollegeComplete.com website and on Twitter @CollegeComplete and @JLRacing to ensure that they are involved in as many contests as possible. A free service, College Complete Education Advocates are standing by, ready to assist you in pursuing your education needs including vocational training, certificates, associates degrees and more.